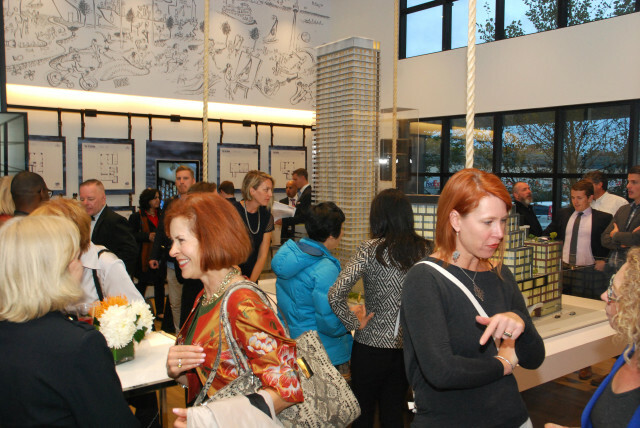 Following an exciting unveiling of public art at HighPark Condos last month, The Daniels Corporation went ahead and outdid themselves with the announcement of public art plans at Daniels Waterfront - City of the Arts (with a name like that, a large contribution to Toronto’s art scene was kind of expected). 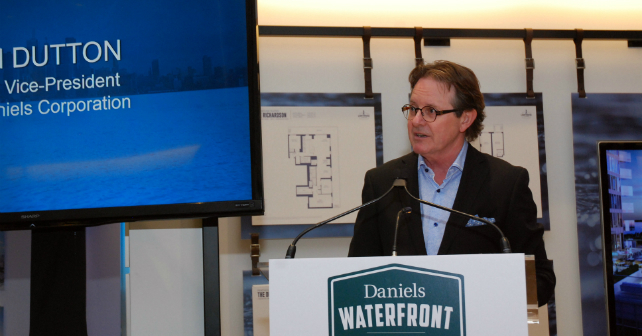 “Daniels Waterfront - City of the Arts will be a living, breathing example of how the arts, education, and economic development can co-exist to invigorate Toronto’s standing on the world stage. It’s bold, it’s forward thinking, it’s the next step in the evolution of this great city,” announced Tom Dutton (top image), Senior Vice-President, Daniels. 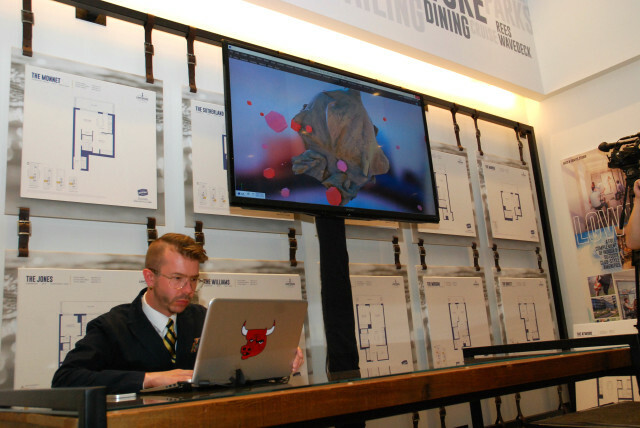 Live artist designing and creating on the fly! 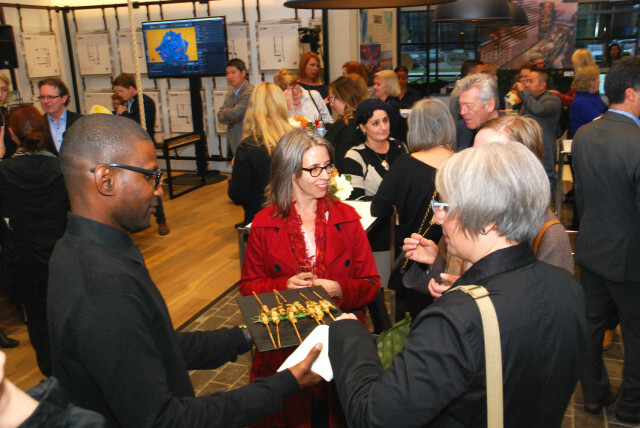 There were three major announcements at the presentation centre: There will be a design competition for the commissioning of the public art; Artscape will have a new creative incubator space, and OCAD University will have an academic space. “It has been proven that art has a positive effect on our lives, well-being and even economic development, which is why we include arts components in every single community we build,” Dutton added. 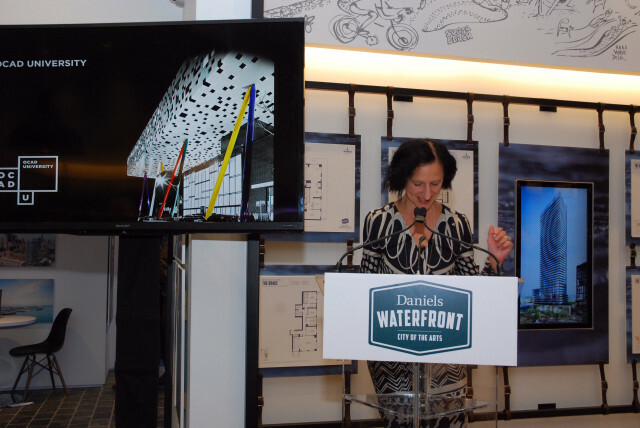 Daniels is committing $3 million to the commissioning and execution of the public art at Daniels Waterfront, $1 million of which will be dedicated to the overall East Bayfront Public Art Master Plan managed by Waterfront Toronto. The competition will be invitation only and feature a number of internationally acclaimed artists, including California-based artist, Ned Kahn. Public Studio, a local collective led by Elle Flanders and Tamira Sawatzky, who was responsible for the public art at HighPark, is also invited to submit a proposal. While committing $3 million to public art is amazing news, we got a bit more excited about the Artscape Launchpad announcement. Students in art school have access to the school’s facilities, but once they graduate and pursue art as a career, they often don’t have the funds to set up shop. Launchpad is basically like a gym for creatives in the city. Membership fees will range between $75 to $150 a month, granting access to a 30,000 square foot co-working space outfitted with equipment, such as 3D printers, computer software, and other traditional supplies. 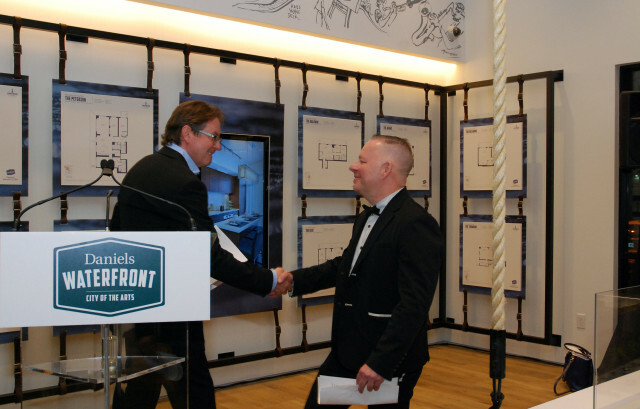 OCAD University will have a 53,000 square foot academic space, and Dutton also announced that Daniels is in discussions to develop a state-of-the-art School of Design for George Brown College. With these three art focused announcements, Daniels is going above and beyond to support the creative industry in Toronto. We can’t wait until the design competition is under way! 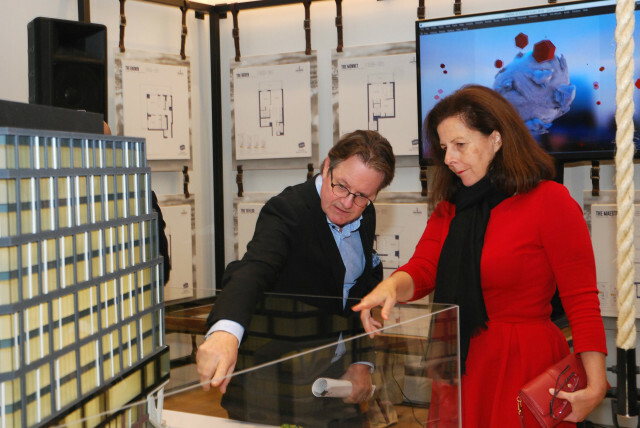 The first phase of residential at Daniels Waterfront - City of the Arts, Lighthouse Tower, has already previewed to Inner Circle members and will be previewing to registrants mid November, so register today!